The holiday afterglow is still in full effect in my household, so I thought I'd stick with the spirit by mentioning two games that always remind me of Christmas. I was a pretty lucky kid in the 1990s. In 1991, Santa gave my brother and me a Super NES. While I can't remember how early we woke our parents up in anticipation of what was under the tree (I'm sure it was still dark outside), I do remember what that morning sounded like. For me, this is more than the sound of the holidays; it is the sound of amazement. Super Mario 64 looks pretty crude by today's standards, but exploring such a massive 3D world was revelation back in 1996. Even today, the size and intricacy of the game's worlds is impressive. On a less nostalgic note, I think these examples demonstrate the importance of launch dates. 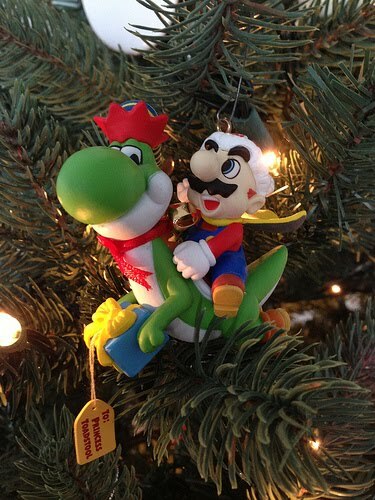 By positioning their big, important games during the time of year people receive gifts, Nintendo ensured Mario would show up in a lot of stockings. As an added bonus, they made sure that people like me would be experiencing their games during a holiday focused around creating warm family memories. Hearing these songs not only reminds me of great games, but of fond times that are now inextricably linked to those games. But enough of my rambling; anyone else have any inadvertent holiday games? Mario is such a strong contender for inadvertent holiday gaming experiences. Specifically for all the reasons you already outlined. Although this didn't happen for me until adulthood, and it happened in reverse. My sister bought my parents Mario Kart Wii, and we wound up having a Mario Kart Christmas and New Years in 2010. Makes me think... maybe I should challenge my dad to some laps since we're in the season. Sounds like a great time. Your story highlights one of the reasons why I think the Wii took off so fast: before the Wii, the last time my family had such a video game-filled holiday was when we got an NES!